We offer employment opportunities to veterans who qualify and are interested in social services work. 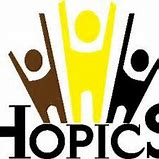 Hopics is a homeless outreach program in South LA. It is engagement based work, meaning it is very outdoors based, about 70% on the streets, 30% office work.